The Committee of Adjustment (COA) consists of 7 persons appointed by Council. The COA functions separately from Council and reviews minor development variance permit applications and consent applications that do not impact a policy or change the intent of a by-law that has been adopted by Council. When do you apply to the Committee of Adjustment? Applications to the Committee of Adjustment include, Minor Variances and Consent. You can apply to the Committee of Adjustment for a Minor Variance if you feel that general regulations or by-laws, when applied to your property impose an undue hardship or cannot be satisfied. You can apply to the COA to sever your land or make a lot line adjustment. You can apply to the Committee of Adjustment for consent to sever a land parcel. This is called a Consent Application. This can include a simple lot line adjustment or the division of land to create more than one land parcel. The Planning Act requires that a "consent" or "plan of subdivision" must be approved before a parcel of land can be divided to create an additional lot or lots. A consent is also called a severance. Controlling the division of land through "severancing" gives the Town of Georgina a way of ensuring that the creation of lots is consistent with the planning policies of the Georgina Official Plan, the Regional Municipality of York Official Plan and Provincial planning documents. What are the Planning Act Requirements the Committee of Adjustment follows? A sign must be posted on the subject property prior to the public meeting. The Secretary –Treasurer of the Committee of Adjustment will provide the applicant with the required sign and give the date for the posting of the sign. Additional instructions will provided along with the sign. A Declaration of the Posting of the Sign must be completed in front of a Commissioner of Oaths. Commissioners are available to assist you at the Town’s offices. Notices of Hearing are mailed to property owners within 60 metres of the subject property. Notices of Hearing are mailed out 10 days before a public hearing for minor variance applications, and 14 days before a public hearing for consent applications. Verbal decisions will be provided by the Committee of Adjustment at the public hearing. Written decisions will be forwarded to relevant parties the day after the public hearing. If a member of the public would like to receive a copy of the Committees Decision, he/she must request a copy of the Decision from the Secretary-Treasurer in writing. The Committee of Adjustment's Decision does not become final until 20 days from the public hearing for minor variance applications and 20 days from the mailing of the Decisions for consent applications, provided that no appeals have been received. 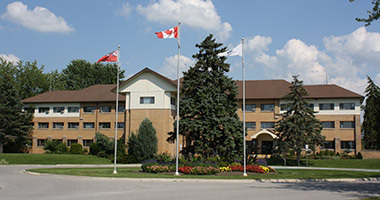 When filing an appeal to the Local Planning Appeal Tribunal (LPAT), please note there will be a charge of $300.00 (a cheque made payable to the Minister of Finance) and there will be an additional Town of Georgina administration fee of $300.00, (cheque made payable to Town of Georgina) payable at the time of the appeal submission to the Committee of Adjustment.